Many have tried to discover who Dr Rampa was, his real birth name, true age, birth sign, etc., everyone who tried failed. This is because they didn’t believe in transmigration, and therefore only dated the physical body Dr Rampa was occupying at the time of its death. I wish to propose a hypothesis that when Dr Rampa died he was between two hundred and seventy-one and three hundred and six years of age. Let's not forget that his guide was over four hundred years old. Tibetan Sage page 106; I have lived over 400 years and more already of this life and I am the one, the only one in the whole of Tibet who understands the workings of these things. That was one of my tasks and my other task was training you... giving you my knowledge so when I pass on in the near future with a dagger through my back you will be able to remember this place, how to get in, how to use all of the appliances and live again the events of the past. Dr Rampa's true birth name. Dr Rampa's actual date of birth. Dr Rampa went to extreme lengths to keep his true identity hidden and I have no intension of revealing that which he held most secret. I will, on the other hand, be revealing via this hypothesis that Dr Rampa underwent three transmigrations; hence his age. Two transmigrations are well documented with his books and the third is somewhat concealed. Also this answers the question many have asked "why at times does Dr Rampa write in the third person?" This and other questions can only be answered by a third transmigration. Candlelight page 93; "but I do refuse to give my age. It's nothing to do with anyone else. My age, which is far more than you would believe, does not affect my book writing, it doesn't add any proof to anything, and in any case I do not want to give any proof because I just couldn't care less about pleasing the Press. The ordinary decent people who read my books do believe me, but as is always the case an extremely noisy minority make a commotion quite impossible to credit unless one is the victim. But, the answer is - No, I will not give my age, and the sole reason is because I do not want to!" Dr Rampa was Tibetan; there is photographic proof that only five other people I know had copies. The photo clearly shows him with his guide, the Great and Powerful Lama Mingyar Dondup, and with the Great Thirteenth Dalai Lama - copy of the photo is shown towards the end of this hypothesis. Therefore, let us start to piece this puzzle together. If you have read all of Dr Rampa's nineteen books, you will know of the most famous and controversial acknowledged transmigration into another physical body was that which belonged to Cyril Henry Hoskins, so there is no need to document this event any further. Many think this was the only transmigration and yet another is clearly documented within Tibetan Sage page 66; "Later on you will inhabit one of these bodies for a year less a day. The day is because the bodies would only last three hundred and sixty-five days without having certain intricate things happen to it. So it is better to have the "take-over" to last a year less one day. 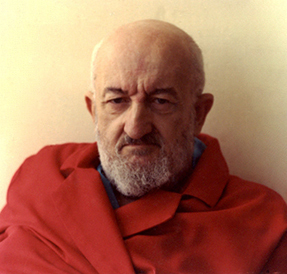 And then – well, the body which you are still occupying would get into the stone coffin, shuddering at the coldness of it, and gradually your astral form would emerge from the substitute body and would enter your own body and take over all its functions, all its thoughts, and all its knowledge. And on that now would be superimposed all the knowledge that you had gained during the past three hundred and sixty-four days." We have clearly demonstrated two accredited transmigrations, so now for the enigmatic third. For this we have to quote various passages from Dr Rampa’s books, in his own words, nevertheless you must remember that the Tibetan High Lamas are masters of misdirection, and I explain why later within this hypothesis. Dr Rampa never lied in any of his books and if you read his books as books of fiction you will completely miss all this, as many did and still do. I will start with the his age, followed by the enigmatic transmigration, as this will help you understand the bigger picture because; without giving any reference to his age, the third transmigration may not be accepted. Let’s begin our quest by starting with his first book. When you start to read The Third Eye you get the impression that this is a story about a little boy, that boy being Dr Rampa, who at the age of seven was sent to join a lamasery to begin the rigorous, years long process of studying to become a qualified Lama. However, based on what’s written in his last book, Tibetan Sage, I propose that The Third Eye is mainly about the Predecessor who was getting the physical body prepared for Dr Rampa’s arrival; the Dr Rampa we all know love and respect. There a very big clue about the concept of a predecessor within The Third Eye that corroborates my hypothesis, but more on that clue later. 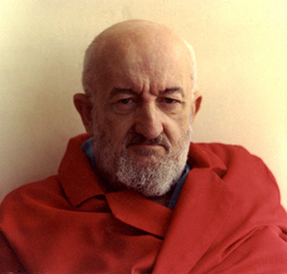 Because nobody would have believed anything he wrote in the first book had he quoted such information as he did within Tibetan Sage, therefore, he had to create a story, making it more acceptable to a very sceptic public who didn’t know or even perhaps believe about such things. This is not a lie, it's misdirection. Until Dr Rampa knew people could, or would, accept such things it's pointless even writing about them. 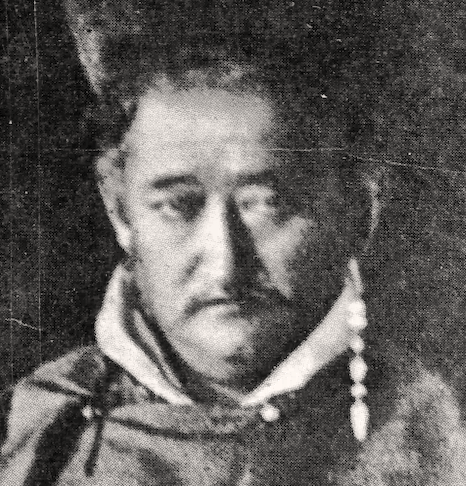 However, we know that when Dr Rampa left Tibet for Chunking he was well over 200 years old, although certainly didn't look it, the photo also corroborates Dr Rampa being much older. If we look at him being a youngster as the book's impression gives us, after arriving at his university in China he had to return to Tibet as the Great Thirteenth is dying and Dr Rampa had to manage the Funeral. We cannot accept such a young person would be given great responsibilities whereas a much older person could. Upon arriving back in Lhasa Dr Rampa’s friends were being bribed with wrist watches by an unknown Westerner; which was possible Sir B. Gould who could have easily pushed aside a young man, whereas someone much older – and a lot wiser – couldn’t be pushed aside so easily. Dr Rampa mentioned in The Rampa Story page 28; "Father had become greatly soured during the Chinese invasion in the first decade of the century." However, although Dr Rampa doesn’t say which century the only recorded "real invasion" was in 1700 when the Chinese annexed East Tibet, and in 1720 they reoccupied Lhasa by force; the 1910 skirmish was misdirection. So, let’s take a middle date of 1710 and then subtract 1981 - the year Dr Rampa died - we have 271 years. I Believe page 119; Dr Rampa tells a cryptic story using clocks, "I was born at the end of the seventeenth century, my long case was polished first in 1675, and since my pendulum was first set swinging I have pondered on the mystery of life, long have I lived, long have I pondered. The humans around us have such a short span of life, they have no time to think, really, of all that there is to know about life". Therefore is "My long case" being the physical, my "pendulum" his heartbeat, "long have I lived since 1675" is this making reference to which year he was born? Hence my remarks of 271 to 306 years of age, That’s the age part established, so let’s move on to the third transmigration. Tibetan Sage page 53; The Gardeners of the Earth are very busy people. Their overseers are even more busy; and if they wanted to know about the real conditions among the earthlings they just took over one of these bodies. Their own astral form entered one of these bodies, they are just cases really, you know, and activated the body. And then one could be a man of thirty, or whatever age suited, without all the bother and mess of being born and living a childhood and perhaps taking a job, and even taking a wife. That could lead to a lot of complications. Tibetan Sage page 71; A baby has several years before it learns a thing, and it has to go to a school, it has to be subject to parental discipline and that is a real time waster. It wastes perhaps thirty or forty years, whereas if the body can do all that and then come to these coffins, then indeed he is worth much more, he knows all the conditions of life in his own part of the world, and he doesn't have to spend years waiting and learning, and not being at all sure of what it is all about. The Thirteenth Candle page 149; The entity who had this special task to do and who for some considerable time had been seeking a suitable vehicle because it is so wasteful for such high entities to have to come down and be reborn and risk losing much knowledge through the traumatic experience of birth, so the entity looked for a suitable grown host and when the time was ripe the body was vacated by one and instantaneously reoccupied by the other. So we now know that anyone coming to this earth for a special purpose never has to bother going through childhood and adolescence – as that clearly just wastes time for the person needing to visit – therefore someone else must inhabit the actual physical body in preparation for the arrival when the real owner arrives and then takes over that physical body. This is then the very first transmigration by the person needing to visit our planet and this transmigration normally takes place between 30 to 40 years of age. Dr Rampa's first transmigration was around 40 years of age and it's documented within The Third Eye. Tibetan Sage page 106; And my other task, he looked at me whimsically, was training you, giving you my knowledge so that when I pass on in the near future with a dagger through my back you will be able to remember this place, remember how to get in, how to use all the appliances, and live again the events of the past. You will be able to see where the world has gone wrong, and I think it is going to be too late in this particular cycle's life to do much about it. But never mind, people are learning the hard way because they reject the easy way. We know that some of the future probabilities that Dr Rampa wrote about have not come to pass, because mankind has made changes, albeit very little so far as we have so much still to accomplish. Wisdom of the Ancients page 17; this is a very rare person nowadays. It is a person who has no Karma, a person who is not necessarily human, but one who adopts human form in order that humans may be helped. It is observed that an Avatar (male) or Avatara (female) is always higher than human. In the Christian Bible you read of angels descending to the deepest hells of Earth in order that they may bring assistance to suffering humanity. Avatars appear on those occasions when the world is in danger, or when humanity as a species is in danger. You may not recognise Avatars because they often have great suffering. They are pure, and unless they are able to take certain suffering they could not stay on the Earth. Dr Rampa was here to discovering this serious flaw in humans which causes mankind to continuously self-destruct; and that very clearly equates to humanity as a species is in danger and requiring an Avatar to visit for a special purpose. This sounds very much like Dr Rampa because he was clearly from Patra and had no Karma, therefore an Avatar. Tibetan Sage page 30, "You and I are different because we are from beyond the astral; we are from Patra." Dr Rampa came to this earth to do a special task which was to clarify faults of human beings to others in the astral plane. They wanted to know why we humans have gone wrong yet again - human beings are a failed species - other people before him have come for the same purpose as he came for, but failed where he succeeded - ergo he wouldn't have wasted time, bother and mess of being born and living through childhood. There are a few downsides to transmigrating into a body that has not been specially prepared. As it Was page 62, Unfortunately when one takes over a body there are certain grave disabilities. Let me give you an illustration, I found soon after I had taken over a body (that of Cyril Henry Hoskins) that I could not write Sanskrit, I could not write Chinese. Oh yes, definitely I knew the language, I knew what I should be writing, but the body which I inhabited was not geared for making those squiggles which are Sanskrit or Chinese. It was only able to reproduce, say, letters such as English, French, German or Spanish. Don't forget that the physical is nothing but a vehicle for the spiritual body. As a crude example to clarify the above statement: assume you are used to driving an automatic vehicle and one day it breaks down. Your garage loans you another vehicle, but this one is not automatic and has manual gears, so unless you know how to use manual gears with a clutch pedal it will cause problems and not perform in the same smooth way as the automatic. Sir Charles bell first met the Dalai Lama in around 1910 and Dr Rampa was there to read his Aura which also means Dr Rampa was certainly born well before 1900; as he had to be taught those skills. Albeit that Dr Rampa was fed information by means of hypnosis and other methods, yet he still had to fully comprehend that information, and that takes time! Tibetan Sage Page 35, Mingyar talking to Lobsang "you are going to be the most educated Lama there ever was in Tibet and you certainly don’t become that is just a few years because this was very, very specialised training. Doctor from Lhasa page 3, "My training was very intensive indeed, because I had to know not only my specialised subjects of medicine and surgery, but all the Scriptures as well because, as well as being a medical lama, I also had to pass as a religious one, as a fully trained priest. So it was necessary to study for two branches at once, and that meant studying twice as hard as the average. I did not look upon that with any great favour! That alone cannot be learnt in just a few years. Candlelight page 159, Well now, actually in theory there is no limit to how long a person can live because it all depends upon the memory stored within our brain cells, the memory which enables the body to reproduce identical parts. If we had a good enough memory, and a sub-conscious memory it is, a person could go on living almost indefinitely. Unfortunately at the present stage of evolution the memory decays. Dr Rampa lived such a long time because his sub-conscious memory was at a much higher stage of evolution to our current stage. Wisdom of the Ancients page 17, a person who is not necessarily human, but one who adopts human form in order that humans may be helped. We know that Dr Rampa took on human form whilst on this planet, but what was his true form? Clues to answer that question are also within his books, however, I am leaving you to find that information for yourself as you may not believe me even if I told you. Update: The following picture is from a book titled "Tibet - The Sacred Realm" by Lobsang P. Lhalungpa. Quote: Dressed in travel clothing, the thirteenth Dalia Lama, Thubten Gyatsho, poses during his exile in India, flanked by staff of high officials. I have since discovered that this photo was taken by Burlington Smith in March 1910. A few days after the Great 13th - with his retinue - visited the Viceroy of India Lord Minto. This photo was taken in Darjeeling a few days later. 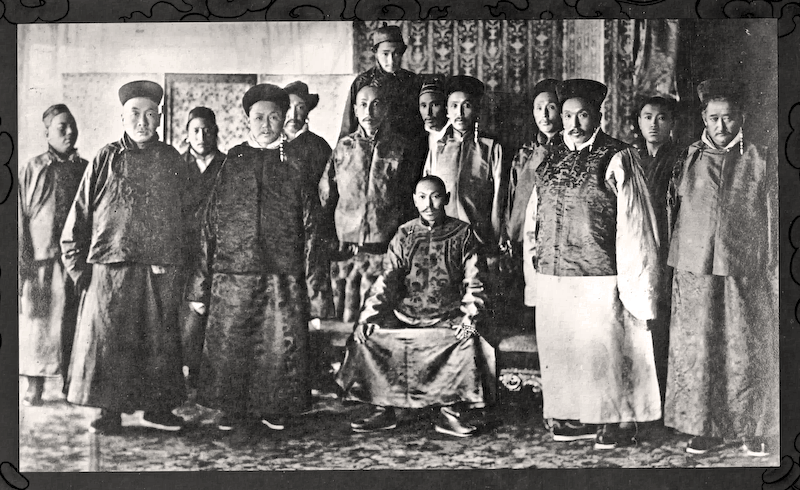 The Tibetan Government with a young 13th Dalia Lama (who lived between 1876 & 1933). Front row right to the young 13th Dalia Lama is Dr Rampa's guide the powerful Lord Mingyar Dondup and right to him is our beloved Dr Rampa. This original photo has not been tampered with, nor is it a fake, therefore I will not enter into any discussions as to its authenticity. Learn how to astral travel and you can know the truth to this photo, as those seeking concrete proof will not. The top image has many similarities to the bottom; for example, the eyes, eyebrows, mouth, and the dimple next to his nose. Recall that he had his nose broken many times by the Japanese in various prison camps, so his nose will look slightly different in the two photos. Remember also he was the only Tibetan who looked like a Westerner. So these are the clues and facts which I base this hypothesis from which we clearly have a third transmigration and the photo proving that Dr Rampa was Tibetan. So why did Dr Rampa misdirect us? Well that's easy to answer, would you have truly believed all this if it was told in the very first book? Highly unlikely as many didn't believe what he did write in The Third Eye, so to make his points viable to a very sceptic public he had to write it in a more acceptable format. This is NOT lying, this is misdirection, because his motives were 100% pure, whereas those who normally lie are defiantly not. The Rampa Story page 23, clearly justifies misdirection: for many this is also known today as a "White Lie" i.e. there is zero mal intensions behind it. My Brother said the Old Man, softly, even though the unevolved, the unenlightened, pretend to believe that you write fiction, enough of the Truth will get to their subconscious and – who knows? – the small seed of truth may blossom in this or in their next life. As the Lord Buddha Himself has said in the Parable of the Three Chariots, the end justifies the means. The Parable of the Three Chariots! What vivid memories that brought back to me. How clearly I remember my beloved guide and friend, the Lama Mingyar Dondup instructing me at the Chapkori. An old medical monk had been easing the fears of a very sick woman with some harmless "White Lie". I, young and inexperienced, had, with smug complacency, been expressing shocked surprise that a monk should tell an untruth even in such an emergency. My Guide had come along to me, saying, let us go to my room, Lobsang. We can with profit turn to the scriptures. He smiled at me with his warm, benevolent aura of contentment as he turned and walked beside me to his room far up, overlooking the Potala. Tea and Indian cakes, yes, we must have refreshment, Lobsang, for with refreshment you can also digest information. The monk-servant, who had seen us enter, appeared unbidden with the delicacies which I liked and which I could only obtain through the good offices of my Guide. For a time, we sat and talked idly, or rather I talked as I ate. Then, as I finished, the illustrious Lama said: There are exceptions to every rule, Lobsang, and every coin or token has two sides. The Buddha talked at length to his friends and disciples, and much that he said was written down and preserved. There is a tale very applicable to the present. I will tell it to you. He resettled himself, cleared his throat, and continued: This is the tale of the Three Chariots. Called so because chariots were greatly in demand among the boys of those days; just as stilts and Indian sweet cakes are now. The Buddha was talking to one of His followers named Sariputra. They were sitting in the shade of one of the large Indian trees discussing truth and untruth, and how the merits of the former are sometimes outweighed by the kindness of the latter. The Buddha said, Now, Sariputra, let us take the case of a very rich man, a man so rich that he could afford to gratify every whim of his family. He is an old man with a large house and with many sons. Since the birth of those sons he has done everything to protect them from danger. They know not danger and they have not experienced pain. The man left his estate and his house and went to a neighbouring village on a matter of business. As he returned he saw smoke rolling up into the sky. He hurried faster and as he approached his home he found that it was on fire. All the four walls were on fire, and the roof was burning. Inside the house his sons were still playing, for they did not understand the danger. They could have got out but they did not know the meaning of pain because they had been so shielded; they did not understand the danger of fire because the only fire they had seen had been in the kitchens. The man was greatly worried for how could he alone get into the house and save his sons? The Buddha turned to Sariputra and said now Sariputra; was not that artifice justified? Did not that man by using innocent means, justify the end? Without his knowledge, his sons would have been consumed in the flames. Sariputra turned to the Buddha and said, Yes, Oh Master, the end well justified the means and brought much good. The Lama Mingyar Dondup smiled at me as he said, You were left for three days outside the Chakpori,and you thought you were barred from entry, yet we were using a test on you, a means which was justified in the end, for you progress well. I too am using a means which will be justified in the end. I am writing this, my true story "The Third Eye" and "Doctor from Lhasa" are absolutely true also – in order that I may later continue with my aura work. 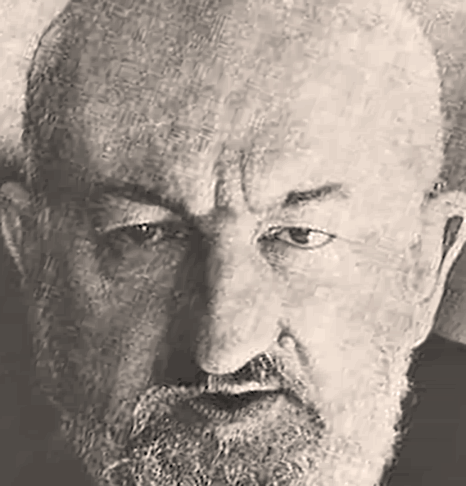 So many people have written to ask why I write that I give them the explanation; I write the truth in order that Western people may know that the Soul of man is greater than these sputniks, or fizzling rockets. Eventually Man will go to other planets by astral travel as I have done! But Western Man will not so go while all he thinks of is self-gain, self-advancement and never mind the rights of the other fellow. I write the truth in order that I may later advance the cause of the human aura. Chapters of Life page 196; these are Dr Rampa's actual words: "What does it matter WHO I am? It is what I WRITE that is important. Throughout the years, hordes of experts have tried to prove me wrong. They have failed. If I am a fake, where do I get the knowledge which others are now copying? All my books contain my own personal experiences, nothing of it is the so-called automatic writing beloved of the Press. I am neither possessed nor obsessed. I am just a person trying to do a very, very difficult task in the face of bigotry and jealousy. There are those in High Places in India and elsewhere who could help, but who prostitute their religion to politics and so, for political reasons etc., they deny the truth of what I write!" Dr Rampa's final words: Tibetan Sage last paragraph of the forward; "I hope you find it believable. If you do not find it believable it may be that you have not yet reached the necessary stage of evolution." Buttercup's final words: "I do like the hypothesis and, here again, you have put it together very clearly and logically and have answered questions before they can be put. Quite truthfully, I could not have done nearly as good a job of it." Please enjoy reading all his nineteen books as they can help anyone who keeps an open mind and is willing to know the truth.